As I’ve mentioned many many times, one of the most exciting things about the Theakstons Old Peculier Crime Writing Festival is that you not only get lots of free books, but often you are also lucky enough to get proof copies of some novels before they go on general sale. 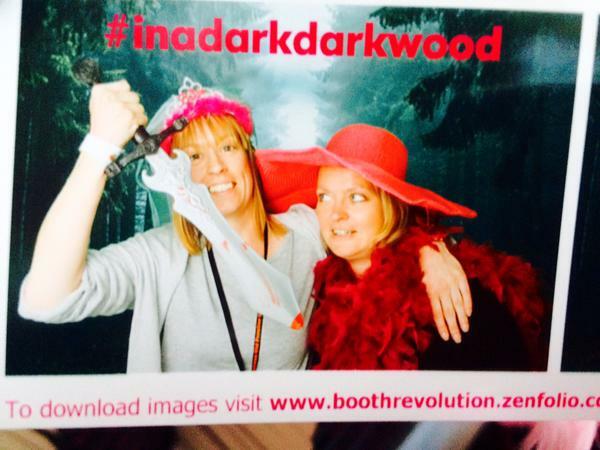 Although this isn’t always straightforward, and the fabulous people at Dead Good Books made us work for a copy of In a dark, dark wood by dressing up in feather boas with a very large hat in order to recreate a murderous hen do. In return I received a copy of the book, which was completely worth the embarrassment. In a dark, dark wood is Ruth Ware’s debut novel. It centres on crime writer Nora who is suddenly invited to the hen do of her child hood friend Claire despite not having seen her for 10 years. She decides to go along in the hope of putting the past behind her, but things go wrong and Nora ends up in hospital with no memory of how she got there or what happened. This was a thoroughly good read. Whilst I don’t think it was a particularly suspenseful or dramatic book, I really enjoyed it and it was one of those books that kept me wanting to read just one more chapter before sleep. The story itself is reasonably predictable and there are few twists, yet the writing is good and it was a fun quick read. The story keeps you interested although it isn’t especially scary, however having spent the past few weeks reading altogether darker crime novels this actually felt like it was a great change of direction for me. There is a very limited number of characters which works really well and gives the story a claustrophobic air that’s adds to the tension. In a dark, dark wood is definitely worth a read, and if you’ve ever been on a hen do and wondered why on earth we go through it, you’ll love this book.